In a word: Great, actually. JM ate the barbecue pork with snow peas and a lemonade. Nichole ate the Emperor's chicken and jasmine tea. 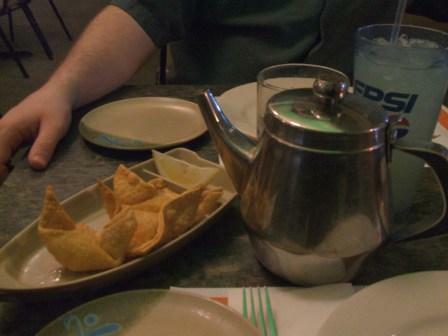 We split an order of cream cheese puffs (crab rangoon). JM and Nichole both gave a Hong Kong Cafe an A- (see our grading rubric). 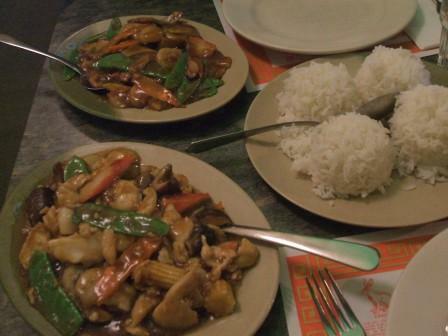 Hong Kong Cafe serves up some of the better, fresher Chinese food in Madison. We chose the downtown location because it was most convenient for us, but it was also fun to watch the traffic roll by right outside the dining room windows. The menu has quite a few more authentic dishes than the average Chinese-American place. In a refreshing touch of truth in advertising, the crab rangoon are called "cream cheese puffs" but we'll just call them good. The wonton wrappers were a bit tough, but the filling was hot and semi-sweet, with a fresh twist of onion. JM's BBQ pork with peapods suffered a bit from sameness, especially with regards to the sweet and salty meat. He may just have picked the wrong dish. Even so, the vegetables were so crisp and yummy, even he ate them all. Each peapod tasted like the cleanest, balmiest spring day the moment you put it in your mouth. And once you actually bit down, the firm snap was very pleasing. Nichole's "Emperor's chicken" was our server's recommendation off the house specials menu. It came in a brown sauce and featured shrimp, imitation crab, scallions, and more exquisitely fresh vegetables. Our dishes were very similar in appearance, but different in flavor - though it would have been nice to pick things that complemented each other a bit more. In all, our high expectations for Hong Kong Cafe were met. General Tso's is a major letdown. Double-cooked pork is good and hot, but bland. Potstickers are more dough than pork (China, can you weigh in here? Is that how you do it?). How can a city like Madison be such a consistent bummer with such a major cuisine like Chinese? Even Americanized Chinese is crap here (although I still haven't hit the spot at Hilldale). Good question. A librarian I talked to (but who declined to comment in person - yet) said that China Palace is the only one in town that her Chinese friends among the faculty will return to. But even there, comments have been mixed. once we ordered-in vegetable egg foo young from hong kong cafe. a simple staple of chinese delivery. what we got was a scrambled egg and some poorly steamed vegetables. probably our single worst experience in madison cuisine. The west side one has been renamed Lee's Garden (same owner and menu, though - just a new name). We couldn't believe they charged us an extra $4 for brown rice (there were two of us). Egad. The food was pretty good, though.